The Germans have a tradition of hiding a pickle on their Christmas tree, and the first child to find it on Christmas morning has a year of luck! Of course, no actual Germans have heard of this tradition, but that won't stop us. 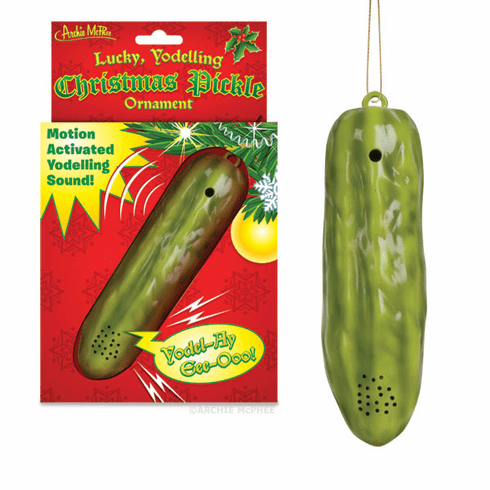 This Yodelling Pickle not only brings luck, but also has a motion detector that, when switched on, makes it yodel when a person or pet comes within 3 feet (1 m). You can set up the plastic, 4-1/2" (11.4 cm) tall ornament near the presents to act as an alarm when someone snoops. Hang twenty of them on the tree to make your own incredible pickle choir. Batteries included.